The plunging price of crude oil is the big story of the energy industry in 2015 so far. Looking back through history, similar oil price moves of this magnitude suggest prices are unlikely to make a meaningful recovery anytime soon. And the impact of this seismic shift in the pricing of hydrocarbons reaches well beyond the oil market. 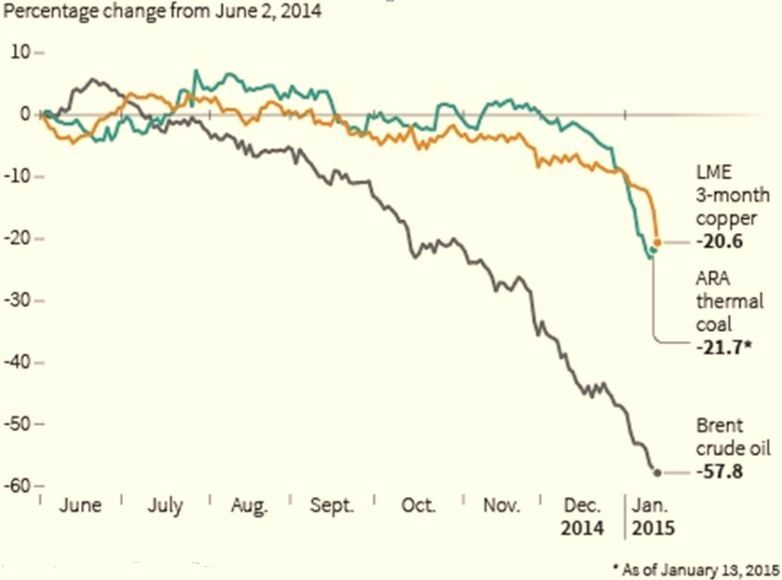 The plunging price of crude oil is the big story of the energy industry in 2015 so far. The impact of this seismic shift in the pricing of hydrocarbons reaches well beyond the oil market. The fall in crude is in turn acting to drag down global gas prices, changing LNG flows and threatening the economics of large volumes of new production. Shifts in the relative pricing of hydrocarbons are also set to shake up the competitive balance across gas, coal and renewable power generation assets. This week we focus on the demand side and look at the crude price fall against a backdrop of a broader sell off in commodity prices and weakening global economic outlook. Next week we look at the specific factors driving the current oversupply in the crude market, as well as how supply side response may act to stabilise the oil market. Finally in the third article we will show an animated view of the evolution of spot Brent vs the forward curve (as we previously did with NBP gas prices), to illustrate the structural shifts that are taking place across the curves in a historical context. Then in series of subsequent articles across the first half of this year we will drill down into some of the more detailed implications of the structural shift in crude pricing for LNG, European gas and power markets. So while there is a specific oversupply story playing out in the crude market, the rapid decline in the prices of other commodities into 2015 suggests a broader weakening in global commodity demand. Is the global economy stagnating? Yield curves across the world have been flattening (longer term yields falling relative to short ones), a dynamic typically associated with expectations of weakening economic conditions. It is important to also take into account the effects of central bank bond purchases on bond yields (Quantitative Easing or QE). But in a sense these bond purchase programs only reinforce the message of underlying economic weakness. The pronounced decline in German yields across 2014 symptomises concerns about Europe joining Japan in a state of prolonged deflationary stagnation. The European Central Bank is expected to respond this week by announcing aggressive new QE measures of its own. But while the world’s major central banks have inflated share and property markets with QE, their success in fostering real economic growth in a debt laden global economy has been limited. The US yield gap over Europe and Japan reflects a healthier US economy in relative terms but one whose fortunes are clearly linked to the rest of the world. But importantly, higher US yields have driven a pronounced rally in the US dollar over the last year. 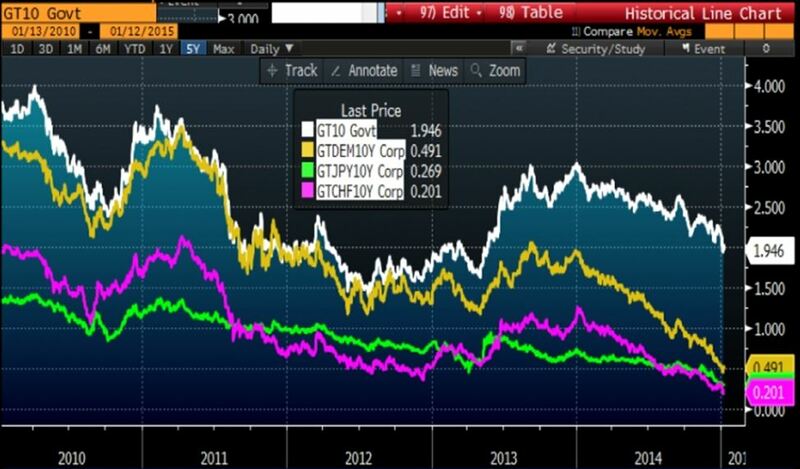 This has also contributed to global commodity price weakness given commodities are traded in USD terms. Falling crude is pulling down oil-indexed Asian LNG prices, a factor that combined with weak spot prices is likely to see a substantial increase in LNG flows into Europe in 2015, particularly into the summer. European oil-indexed gas contract prices are also set to decline as 2015 progresses (once the impact of contract price lags feeds through), putting downward pressure on gas forward curves and hub prices as well as having important implications for the value of gas flexibility. The relative pricing of coal and gas (influenced by oil) will alter generation dynamics in European power markets as well as bringing down absolute power prices. We will follow through on each of these themes in a number of subsequent articles across the first half of 2015. But next week we continue our focus on crude with a more specific look at supply side drivers.